Mohammad Tamimi, a member of the Popular Committee Against the Annexation Wall and Colonies in Nabi Saleh, said the soldiers attacked the weekly nonviolent protest with rubber-coated steel bullets, gas bombs and concussion grenades. He added that several protesters suffered the effects of teargas inhalation and received the needed treatment. Tamimi also said that the soldiers closed the two iron gates, on the main entrance of the village, and prevented the Palestinians from entering or leaving it. Furthermore, the soldiers launched a surveillance balloon over the village, to monitor the movement of the residents. 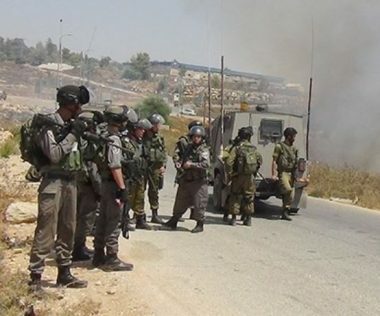 In related news, the soldiers injured several protesters, in Kufur Qaddoum town, east of Qalqilia, in the northern part of the occupied West Bank, after the army attacked the weekly nonviolent procession. Also on Friday, the soldiers attacked the weekly nonviolent procession against the illegal Annexation Wall and colonies, in Ni’lin village, west of Ramallah, causing many protesters to suffer the effects of teargas inhalation.